One of my favorite parts of traveling is trying new foods. And hands-down, my favorite meal of the day while traveling is breakfast. Some of the best breakfasts I’ve had in my life were experienced in Europe: The brown bread and jam in Ireland; The pan con tomate in Spain; The croissants, fruit, and café au lait in France. I’m getting wanderlust just thinking about it! Now I know I can’t lump all European breakfasts together. Each place definitely has its own take on breakfast. But there are some delicious commonalities. 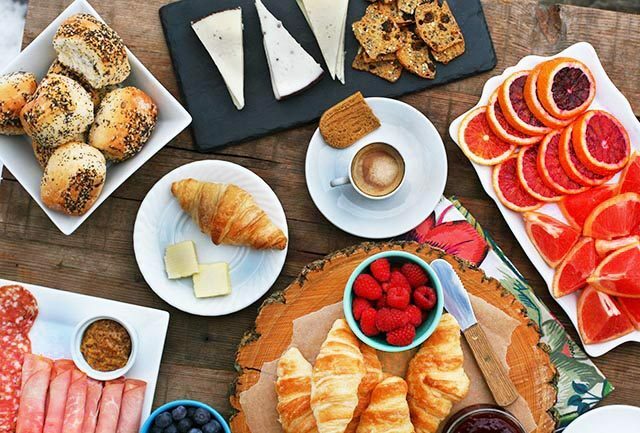 I wanted to create a breakfast spread that has some of the European breakfast components to it: Espresso, croissants, fruit, meat, cheese… all the good breakfast stuff, in my opinion! The next time you need to make budget-friendly breakfast or brunch for a group, keep this idea in mind. Number of guests: This type of menu makes it easy to feed a crowd. Keep in mind the number of guests and buy accordingly. Cost: To keep costs down, shop at discount grocery stores (like ALDI), use what you have on hand (jam, fruit, etc. ), and be sure to repurpose any leftovers. Assemble, don’t cook: Want to keep your breakfast buffet as simple as possible? Take advantage of ready-to-eat foods – and avoid complicated recipes. This breakfast spread doesn’t require cooking or baking: It requires assembling. 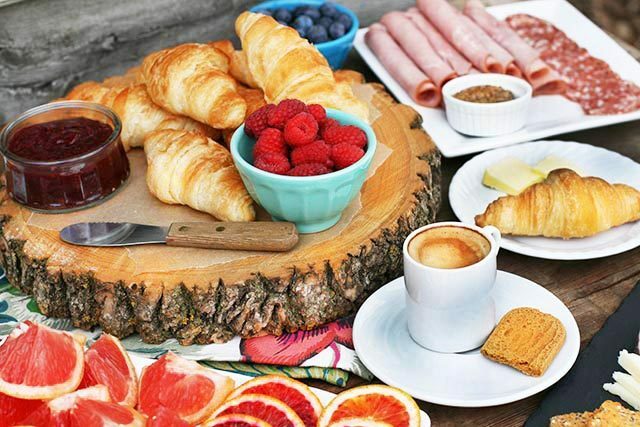 Let’s take a look at each of the components of this European-style breakfast. The most important part of breakfast, in my opinion, is the coffee. And with a European-style breakfast, it has to be espresso. If you have a Nespresso machine (or other espresso machine), let your guests choose their own style and flavor of espresso. Put a variety of espresso coffee capsules in a container. I was given the opportunity to try Gourmesso coffee, which are Nespresso-compatible espresso capsules. They cost 35 percent less than Nespresso, making at-home espresso all the more affordable. The Gourmesso capsules will impress your guests while keeping costs down. Shopping tip: I bought a dozen croissants at ALDI for less than $4.00. A simple meat and cheese plate is a welcome addition to this breakfast spread. Aim for one or two meats and cheeses. I chose deli ham, salami, and a trio of Spanish cheeses, also purchased at ALDI. Choose two or three fruits, and prep them so they are ready to eat. Presentation is important when you’re hosting guests. Spend some time assembling your plates. Use a variety of colorful serving dishes. Break out the good china. This will make it all the more fun for your guests – and for you, too! As much as I also LOVE European breakfasts, why not bring them right into your own kitchen. Super idea. Super pictures! Makes me hungry.